Perfect information in economics is used to describe a subset of perfect competition. With perfect information in a market, all consumers and producers are assumed to have perfect knowledge of price, utility, quality and production methods of products, when theorizing the systems of free markets, and effects of financial policies. Perfect information is also a game situation in which an agent is theorized to have all relevant information with which to make a decision. It has implications for several fields. Backgammon is an example of a game with perfect information that involves chance. Both players are completely aware of the state of the game at all times and can use this to inform their decisions, but the progress of the game will depend on random dice rolls. In game theory, an extensive-form game has perfect information if each player, when making any decision, is perfectly informed of all the events that have previously occurred. Chess is an example of a game with perfect information as each player can see all of the pieces on the board at all times. Other examples of perfect games include Tic-tac-toe, Irensei, and Go. The formal definition can be easily extended to include games with exogenous uncertainty from chance events, such as in Backgammon, or simultaneous move games, such as in the iterated prisoners' dilemma, or both, such as in Goofspiel. 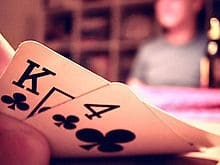 Card games where each player's cards are hidden from other players, as in contract bridge, are examples of games with imperfect information. In 2015 two-handed Texas hold'em with bounded bidding was solved.